The site dates from the late Neolithic-early Bronze Age (approx. 2500-1500 BC) and consists of a slightly-flattened circle of 19 stones, ranging in height from 0.8m (21⁄2ft) to 1.5m (5ft). A number of stones have fallen over the years and been re-erected again, and there are also a number of other stones lying about. There was originally a second circle in the adjoining field to the west, some stones from which can be found in the hedge. There may also have been a third circle in the same alignment a few yards further west (identified from crop markings) but equally this may have been the remains of a cairn (burial) circle. Tregeseal Stone Circle lies on Truthwall Common near to St.Just. It is located on the southern fringe of the West Penwith moors, which at this point are dominated by the natural outcrop of Carn Kenidjack. There are several ways of reaching the circle from St.Just. Take the B3306 road from St.Just towards St.Ives. Just outside St.Just at the bottom of Nancherrow Hill, there is a two way right-hand turning. You may park here and walk up No-Go-By hill until you reach a right hand track (Kenython Lane). Walk up this track which will take you on to the moors and down to the stone circle. Alterna- tively, when you turn right at the bottom of Nancherrow Hill, continue driving for about half a mile, then take a left hand turn beside some houses and drive on for about a mile until you reach a small parking area (room for 2 cars) with a signpost to the circle. Follow the track and at a junction take the left hand fork which goes through a farm, and then on to the moors and to the circle. This area of Truthwall Common is rich with legends of the Otherworld: fairy folk, demons and devils. One story tells of how a local miner chanced upon a Fairy Feast at the circle and was bound in gossamer thread and left there all night; another tells of an encounter with the Devil himself on Carn Kenidjack, which dominates the horizon from the circle; and yet another tells of Pee Tregear who was piskey-led here and encountered the little folk. All these stories may be memories of the ancestors and spirits of the dead, for this whole area was for- merly covered with prehistoric barrows, burial mounds and megalithic monuments. It seems likely that Tregeseal Circle, along with other stone circles in the area, was a place of ceremony and ritual. 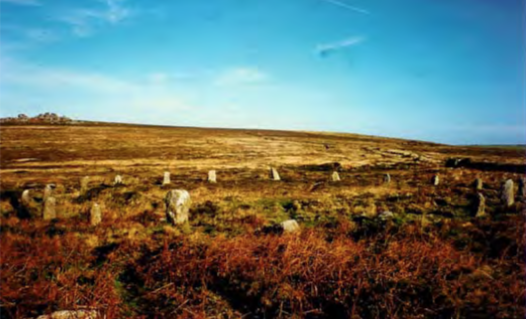 Together with its twin (or triple) circles, it was probably originally the centre of a whole area of ritual monuments, perhaps all focussed on the distinctive shape of Carn Kenidjack that overlooks the moor. It is known that Carn Kenidjack was a Tor Enclo- sure, which means that it was used as well, perhaps as a separate sacred area. It was proba- bly thought of as the dwelling place of the ancestors or the Gods/Goddesses, and there may have been a ceremonial path from the circle(s) to the Tor Enclosure on Carn Kenidjack.